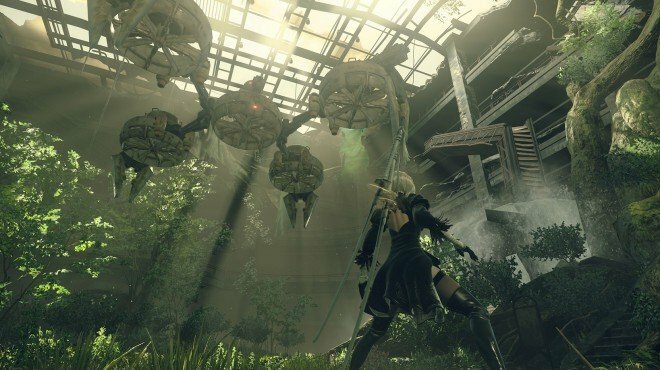 To the Top Floor is a Main Story Quest in NieR: Automata. "The answers must be somewhere within the tower, keep going upwards until you find them." A2 will face the conciousness. Defeat them for a while until your pod interjects, then focus on dodging and not taking damage. Eventually, the consciousness will saturate and fight each other. Defeat the remaining ones to exit and begin your ascent to the top floor. Ko-Shi will attack you. It's a dodge-and hit fight, focus on not getting clipped by the razor-sharp claws or the beams. Next you will be on 9S's flight unit for a flight section. From here, you will alternate Ko-Shi and Ro-Shi battles between your two androids.